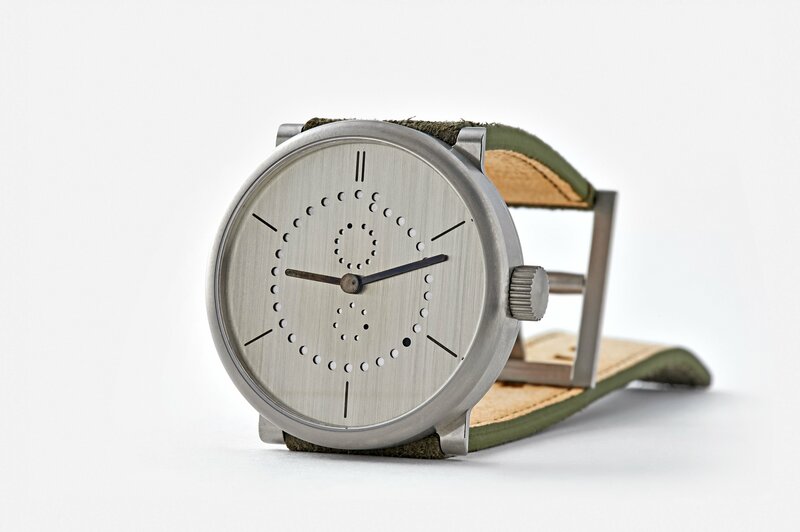 The high contrast dial on this new annual calendar is made from German silver — with no added color. Ludwig Oechslin frequently prototypes in German silver due to its silvery white appearance and excellent machinability. 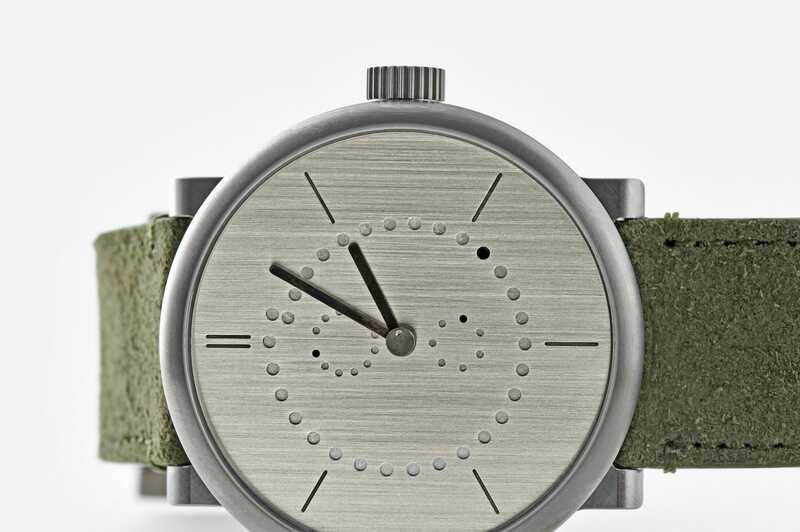 To achieve high contrast with a single metal, the markers were first milled out of the dial. Then, the dial surface was hand-patinated with an antique art sculpture restoration solution, pre-aging the metal until it was nearly black. 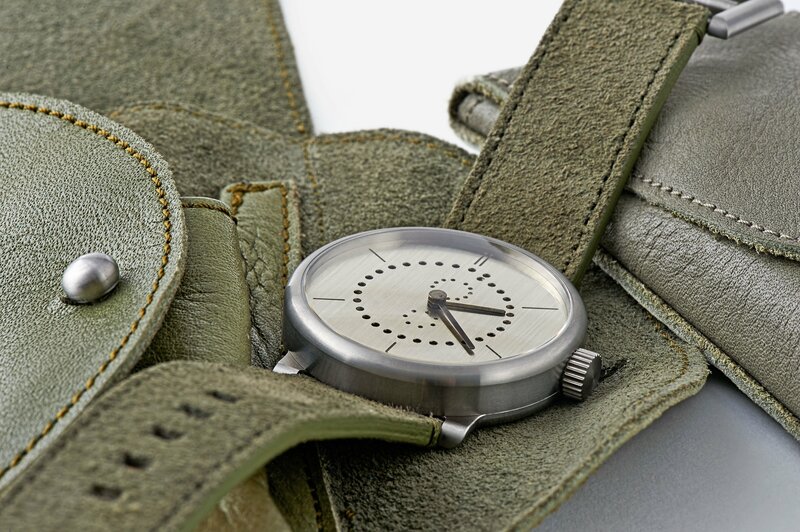 Finally, the dial was brushed with a very fine sandpaper, restoring the surface to its original silvery appearance. 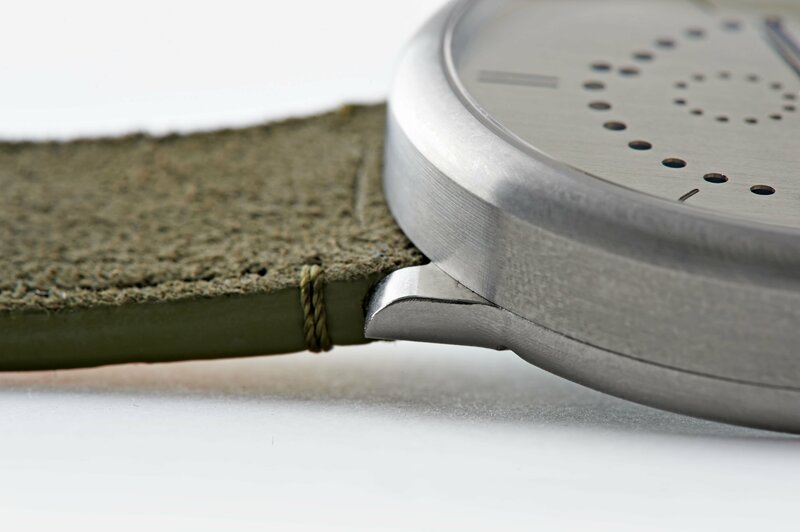 The markers which were milled a level down are untouched by the sandpaper, and provide sharp contrast with the dial. Dr. Oechslin developed this technique for creating dial contrast in order to rapidly prototype at his workshop without the need for external partners. As it happens, there is a quiet beauty to his solution, even though it was driven by practical workshop concerns. Typical Oechslin! The 42mm titanium annual calendar in these pictures just finished production and is ready to ship via FedEx or pickup at our Lucerne workspace. 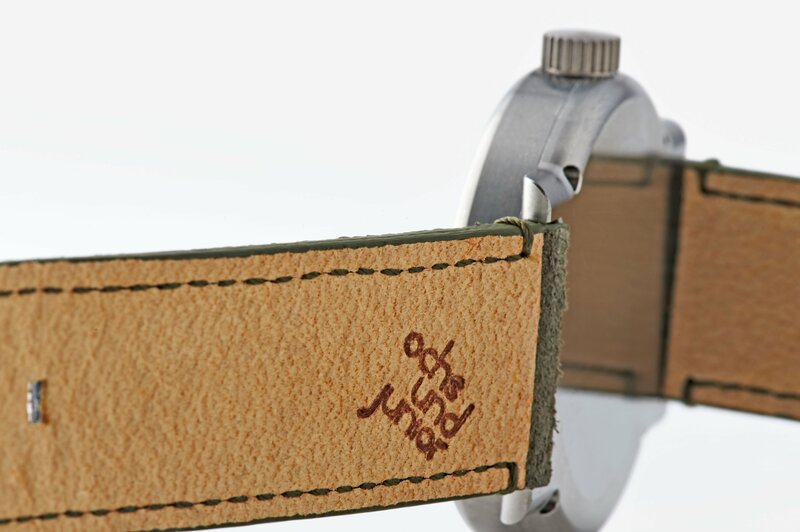 Here it has been paired with an exceptionally soft and supple khaki green eco-tanned suede leather strap. 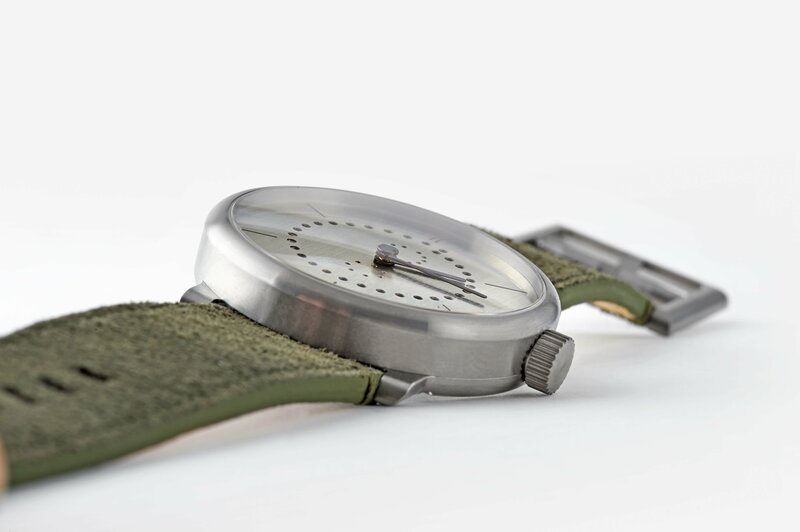 A robust sturgeon leather strap hand-made by Sabina Brägger, or a nappa leather strap in 38 colors would also fit it perfectly. ochs und junior watchmaker Sandra Flück donned this annual calendar for the final photo! 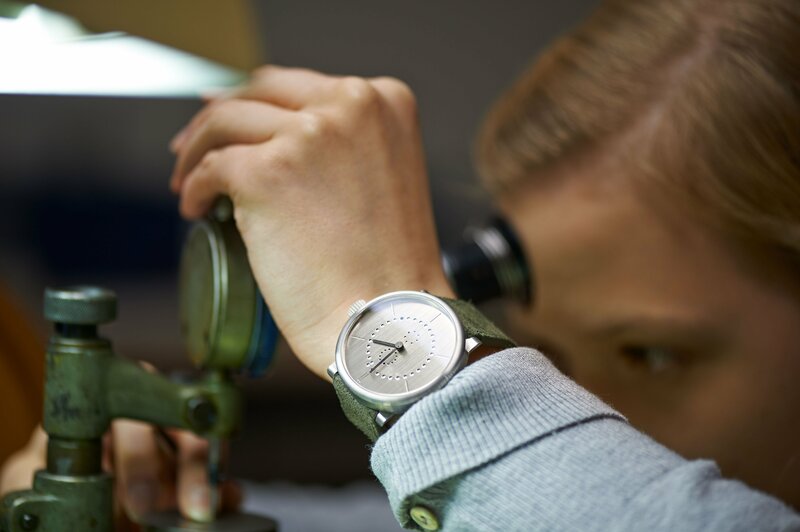 Your German silver annual calendar can be manufactured in a silver or titanium case and in 36mm, 39mm, or 42mm sizes.